Qi Wang, an Association for Psychological Science (APS) Fellow esteemed for her scientific contributions on culture and autobiographical memory, reflects on her career path in an interview with Suparna Rajaram, the President of APS. Wendy Williams, founder, and director of the Cornell Institute for Women in Science (CIWS) has edited a special edition of a journal on evidence-based research about factors that affect the academic and professional lives of women in STEM fields. In her editorial of Underrepresentation of Women in Science: International and Cross-Disciplinary Evidence and Debate, Williams provides a framework for understanding some of the issues and viewpoints that surround the debate of women in science. Gary Evans and colleagues are the first to show that parenting can have long-term effects on pro-environmental attitudes and behaviors in adulthood. This has important implications for education and public policy. In his blog, The Methods Man, F. Perry Wilson MD, commends the quality of Jane Mendle's research on how early puberty may lead to depression in adulthood. Her results have important implications for depression screening recommendations of girls in early puberty. In a recent paper, Valerie Reyna and Rebecca Helm reported that adolescents are more likely than adults to plea guilty to crimes they have not committed. They argue that the decision-making processes involved with plea-bargaining are developmentally immature in adolescents and they are vulnerable to pleading to a lesser charge even if innocent. Daniel Casasanto and graduate student Geoffrey Brookshire propose an exciting new theory that, contrary to the prevailing view that different emotions are localized in specific areas of the brain, emotions are “smeared over both hemispheres” depending on an individual’s handedness. 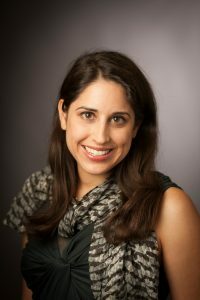 Katherine Kinzler studies the development of social cognition, with particular emphasis on exploring infants’ and children’s attention to the language and accent with which others speak as a marker of group membership. A recent article by the BBC explores her research and its implications for empathy, cultural learning, and trust. Posted in Issues and tagged adolescence, APS, autobiographical memory, CIWS, College of Human Ecology, cornell institute for women in science, culture, Daniel Casasanto, depression, early puberty, ecology, environment, Gary Evans, girls, human development, Jane Mendle, Katherine Kinzler, Qi Wang, Rebecca Helm, valerie reyna, Wendy Williams on July 31, 2018 by Allison M. Hermann, Ph.D.. In his blog, The Methods Man, F. Perry Wilson MD, commends Jane Mendle's research on how early puberty may lead to depression in adulthood. Her results have important implications for screening girls in early puberty for depression. Several animal studies and basically all of human experience have taught us that puberty is a particularly difficult stage of life psychologically. A new study appearing in the journal Pediatrics now suggests that early puberty in girls can lead to depression and anti-social behavior well into adulthood, suggesting that the difficulties of those teenage years are far from fleeting. Researchers led by Jane Mendle, at Cornell used data from the National Longitudinal Study of Adolescent Health, a nationally representative survey study which ran from 1994 to 2008. More than 10,000 girls, average age 16 years, were interviewed at the start of the study and followed into their late 20's. Over that span, they were asked about depressive and antisocial symptoms. They also reported the date of their first period, which is a proxy for pubertal development. 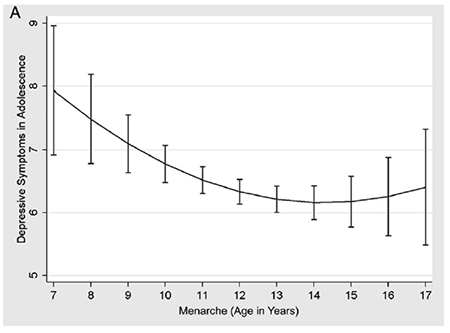 The average girl reported the onset of menarche at around 12 years, but there was a wide distribution, with about 10% of girls reporting a first period at age 10 or younger. The study showed that a younger age of menarche was associated with greater depressive symptoms in the later teen years. Perhaps more interestingly, it showed that younger age at menarche was associated with more depressive symptoms even as the women approached 30 years of age. In an elegant analysis, the authors went on to show that the driver of that elevated depression rate in later adulthood was the depression in the teenage years. In other words, girls who develop early are more likely to get depressed as teenagers, and that depression may set the tone for decades to come. Now there are some factors here that were unaccounted for, body weight being a major one. Overweight and obese girls go through puberty earlier, and body weight is a risk factor for depression. I asked Mendle about this potential confounder. "We know that people treat girls who look very physically mature different from girls who do not look physically mature and that is not purely attributable to weight. We know that parents do it and we know that teachers do it. There is also not any good evidence that weight would be influencing the antisocial and externalizing behaviors that were seen". Clinically, whether early puberty is a sign of other stressors or a cause of distress in itself might not matter. If early puberty is associated with depression, the implication is that pediatricians should start screening for depression earlier in girls who develop earlier. The United States Preventative Services Task Force currently recommends screening for depression starting at age 12. For some girls, an even earlier intervention may have long-lasting effects. F. Perry Wilson, MD, MSCE, is an assistant professor of medicine at the Yale School of Medicine. He is a MedPage Today reviewer, and in addition to his video analyses, he authors a blog, The Methods Man. You can follow @methodsmanmd on Twitter. Posted in Features and tagged adolescent, College of Human Ecology, depression, early puberty, human development, Jane Mendle, puberty in girls on July 31, 2018 by Allison M. Hermann, Ph.D..